In a move that may signify more than just a reward for a young prospect, Lias Andersson has been recalled by the New York Rangers. The team has placed Brett Howden on injured reserve to make room on the roster, but it could point to the team preparing to sit out some of their high priced trade assets ahead of Monday’s deadline. The Rangers have three games in four nights before the deadline passes, and players like Kevin Hayes and Mats Zuccarello are drawing plenty of interest from around the league. Andersson, 20, was the seventh overall pick in the 2017 draft and made his NHL debut last season with the Rangers. He was given an even bigger chance this year by getting into 21 games, but failed to make much of an offensive impact and found himself back in the minor leagues. The talented Swedish center has 20 points in 36 games for the Hartford Wolf Pack, but still has immense upside and will likely be a huge part of the Rangers short rebuild. The Rangers of course don’t have to pull players like Hayes and Zuccarello out of the lineup, but with the chance of trade over the next few days still exceedingly high it would benefit them to protect their assets. The trade market is being held hostage right now by the top names like Matt Duchene and Artemi Panarin, but Hayes and Zuccarello have already drawn plenty of interest from around the league. The New York Rangers have decided it is time to give one of their other young players a chance. The team has recalled forward Lias Andersson from the minor leagues prior to their game tomorrow night against the Montreal Canadiens. The move comes as Brett Howden missed this morning’s practice, leading to doubt he’ll be able to suit up against Montreal. The team is taking it “day by day” with Howden according to head coach David Quinn, but now have another impressive rookie to consider. Andersson, 20, was the seventh overall pick in 2017 and put on quite a show at training camp that fall before ultimately being assigned to Frolunda in the SHL. His return to Sweden wouldn’t last the whole season though, as soon after competing in the World Junior Championship he was brought over to join the Hartford Wolf Pack before eventually making it up to the Rangers for seven games. He registered two points in those seven contests, while performing well at the AHL level in 2017-18. This season has started out even better for the young center, as he has 12 points in 14 games for the Wolf Pack and looks like he is ready to take the next step. A dominating presence on the ice in the minor leagues, Andersson is set to be a huge part of the rebuild in New York along with fellow top prospects Howden and Filip Chytil. The team is already off to a better start than many expected, sitting at 6-7-1 through their first 14 games and coming off three straight wins. Though it seems unlikely that they’ll challenge for a playoff spot this season, seeing the likes of Andersson take a step forward to prove he is an NHL talent would be a positive development. The Pittsburgh Penguins could find themselves down a defenseman for a while after Justin Schultz went down Saturday with what looks to be a gruesome leg injury (video link here). According to the Penguins, he needed to be helped off the ice after falling awkwardly in slow motion and either injuring his ankle or knee, after getting tangled up with Montreal’s Tomas Plekanec. While more information won’t be known until Sunday at least, the idea of losing Schultz, one of the top defenseman isn’t a good sign. The 28-year-old already had four assists in three games played this season. Assuming he’s out for any length of time, the team could look to insert Juuso Riikola into the rotation. The Finnish free-agent, who signed with the team this summer, has impressed the Penguins throughout training camp and earned a spot as an extra defenseman, but has played in just one game so far this season. Vancouver Canucks fans have to be worried after rookie Elias Pettersson took a massive hit from Florida Panthers’ Mike Matheson and then was thrown down on top of that (video link here). The 19-year-old rookie immediately left the game with a trainer, according to TSN’s Brennan Klak. Pettersson had already put up a power play goal in the game and led all rookies with five goals and eight points this season. No word on the severity of the injury. NBC Sports Joe Haggerty writes that Detroit Red Wings defenseman Joe Hicketts will likely struggle all season as the diminutive blueliner at works his way through his rookie campaign with his physical brand of hockey. While the 5-foot-8 defenseman played an impressive 23:39 against the Boston Bruins Saturday and had five hits, he finished with a minus-3 and showed that he’ll struggle against top competition and skaters such as the Bruins depth that he faced Saturday. Rick Carpinello of The Athletic (subscription required) profiles the play of the New York Rangers’ Brett Howden, who seems to be showing the team that he’s more than just a grinder. The 20-year-old has been impressive since training camp and his play forced the Rangers to send 2017 first-rounder Lias Andersson to the AHL. The Rangers acquired Howden, a 2016 first-round pick, from Tampa Bay in the Ryan McDonagh deal last season, but has already posted two goals in the Rangers’ first five games. Poll: Who Will Win The Calder Trophy In 2018-19? The Athletic’s NHL Draft and prospects guru Scott Wheeler has released the first definitive list of candidates for the Calder Trophy in 2018-19, and the order may surprise some people. Admittedly, the list is in the context of fantasy hockey, but Wheeler’s rankings are true to how he thinks Calder voting will unfold if each rookie hits their stat projections. As such, it’s not this year’s first overall pick, Buffalo Sabres defenseman Rasmus Dahlin, at the top of the list, but presumptive top-six center for the Vancouver Canucks, Elias Pettersson. Pettersson will be put in a much better position to rack up points than will Dahlin, the next-best candidate, as potentially one of the three best scoring forwards for the Canucks and traditionally productive forwards have a better shot at the Calder than (relatively) equally productive defensemen. Coming in at number three is Boston Bruins forward Ryan Donato, who led both the NCAA and Olympics in goals last season and will look to win a top-six role for Boston and continue to find the back of the net at an alarming rate. Playing alongside either Brad Marchand and Patrice Bergeron or David Krejci and Jake DeBrusk is an easy way for Donato to quickly become an elite scorer at the NHL level. The fourth-ranked candidate is second overall pick Andrei Svechnikov of the Carolina Hurricanes, who – like Pettersson – will be given an immense amount of responsibility right away as a top-six winger who is arguably already one of the three most skilled forwards on the team. However, Svechnikov is one of three Hurricanes rookies on Wheeler’s list, which could take away from his case. Rounding out the top five is Dahlin’s fellow rookie in Buffalo, center Casey Mittelstadt, who scored at nearly a point-per-game pace in the college ranks and in a brief stint with the Sabres to end the year. Mittelstadt should face favorable match-ups this season with the lines anchored by Jack Eichel and Patrik Berglund drawing considerable attention from the opposition. What do you think? Who will be the NHL’s Rookie of the Year and take home the Calder Trophy at the end of the season? The favorite? The first overall pick? Another top candidate? Or a name not even mentioned here? With many teams in the league looking for center help this offseason and seeing few options on the free agent market, the trade market seems to be the best way to fill that heavily in-demand. Just earlier this week, the Montreal Canadiens traded Alex Galchenyuk, who failed to succeed at the center position for the team in previous years, to Arizona. The Coyotes have already stated they intend to move him back to center in hopes that he can make the conversion and fill their No. 2 center hole. The New York Rangers seem to be in a unique situation. Despite the franchise suddenly finding themselves in rebuilding mode, the one thing the Rangers have plenty of is reliable centers. In fact, the team has eight potential centers currently on the roster, including Mika Zibanejad, Kevin Hayes, Lias Andersson, Filip Chytil, Vladislav Namestnikov, Ryan Spooner, Boo Nieves and Brett Howden. While some of those eight will be forced to move to the wing position, there is also a strong possibility that the team will move at least one of those centers during the offseason, and very possibly, before next week’s draft. Larry Brooks of the New York Post writes that while the team has a solid combination of Zibanejad, Chytil, Hayes and Andersson currently penciled in as their top four centers next season, that’s a logjam at that position that likely would not aid the development of Chytil and Andersson, two teenagers who need as much playing time as possible at the NHL level. Andersson especially, last year’s No. 7 pick in the 2017 draft, needs time on the ice and a fourth-line role isn’t going to cut it. The scribe writes that Hayes may be available after quietly putting up a career-high 25 goals while playing center for New York last year. The restricted free agent is in line for a potential five-year deal worth about $4.5MM per year based on his success last season and there is no guarantee that Hayes would earn the No. 2 center spot with all this depth. Regardless, Hayes would be a highly coveted commodity for many teams who are in desperate need for help at that position. The key for the Rangers is to trade him straight out for help on their blueline, according to Brooks, who adds that New York is unlikely to use Hayes as part of a package to move up in the draft. The team’s biggest need is at defense and there are many teams that could use a center and have defense to trade, including the Calgary Flames who might be ready to move Dougie Hamilton. Though we’re only partway through the second round of the playoffs, many fans have already started dreaming about what could happen on July 1st in free agency. Craig Custance of The Athletic (subscription required) gives us an update on each of his top-20 free agents, including superstar John Tavares. Obviously Custance can’t handicap a market, but he does mention the San Jose Sharks, Chicago Blackhawks and St. Louis Blues as potential pursuers if the New York Islanders’ captain does hit free agency. Tavares would have almost every team checking in should he get to the negotiating window a few days before July 1st. The Halifax Mooseheads have hired a new head coach for the 2018-19 season. Eric Veilleux will be behind the bench for the QMJHL squad next season, fresh off his own departure from the Colorado Avalanche AHL affiliate. Veilleux has plenty of experience in the Q, having played there as a junior and coached for nearly a decade. The IIHF handed out several suspensions yesterday to the Swedish World Junior squad, after the incidents that occurred after this year’s gold medal game. Players and coaches removed their medals before the post-game event was over, including captain Lias Andersson who tossed it into the crowd in frustration. Interestingly though, of the players suspended only goaltender Olle Eriksson Ek could realistically return to the tournament. The others—Andersson, Axel Jonsson-Fjallby, Jesper Boqvist and Rasmus Dahlin—have either graduated through age or are expected to be in the NHL full-time next year. Perhaps the biggest hit will be the coaching suspensions, which includes a three-game ban for head coach Tomas Monten. Sweden released their preliminary roster for the upcoming World Championships, and it is loaded with NHL talent. John Klingberg, Adam Larsson, Oliver Ekman-Larsson, Erik Gustafsson, Adrian Kempe, Mikael Backlund, Johan Larsson, Mattias Janmark, Lias Andersson, Jacob de La Rose, Magnus Paajarvi and Mika Zibanejad will all be heading to the tournament for the Swedes. Though obviously this group is missing some of their top options like Erik Karlsson and Henrik Zetterberg, it will also have some very interesting young players filling the gaps. Vegas Golden Knights draft pick Erik Brannstrom will be among the defense corps, and Rick Dhaliwal of News 1130 in Vancouver expects Elias Pettersson will be added soon. There have been some conflicting reports on Slava Voynov’s potential return to the NHL, but Arthur Staple of The Athletic can make one thing very clear. The New York Islanders have not reached out to anyone connected to the former NHL player, and have “zero interest” in bringing him aboard. Whether or not any team will actually sign the 28-year old defenseman is still unclear. The Anaheim Ducks will not bring back assistant coach Trent Yawney next season, choosing not to renew his contract. Yawney has been with the Ducks organization for seven seasons, first as head coach of their AHL affiliate (Syracuse, then Norfolk) and the last four seasons as an assistant to Bruce Boudreau and Randy Carlyle in the NHL. With the New York Rangers in rebuilding mode and the expected full-time roles that are likely to be given to top prospects Lias Andersson and Filip Chytil, the writing looked to be on the wall for veteran center David Desharnais. Now, European insider Igor Eronko reports that the 31-year-old Desharnais intends to continue his career overseas with the KHL. Desharnais was unlikely to return to New York as he will be an unrestricted free agent in July. 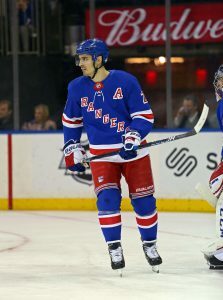 He signed a one-year, $1MM contract last summer to help offset the Rangers’ losses of Derek Stepan, who the team traded to Arizona, and Oscar Lindberg, who the team lost to the Vegas Golden Knights in the expansion draft. The team had hopes that Andersson might make the team out of training camp, but also wanted insurance in case the 18-year-old didn’t. Desharnais provided that depth after Andersson was returned to Sweden, and played 71 games, but tallied just six goals and 28 points this season. While there is no word on whether he has a deal in place, Desharnais has spent most of his career in North America, having only played 16 games during the 2012-13 strike in Switzerland. Desharnais played most of his career for the Montreal Canadiens and had several good seasons, including 60-point, 52-point and 48-point seasons between 2011 to 2015 seasons. However injuries have derailed his career and the veteran has struggled to hold onto his roster spot as the Canadiens traded him to the Edmonton Oilers last season for their playoff run, while the Oilers opted not to re-sign him last offseason.